The Owl is sacred to Athene, Greek goddess of Wisdom & Learning. He is drawn about to take flight for an evening's hunting at dusk. Owl through the ages has symbolized Wisdom, Mystery, Transition, Messages, Intelligence, Mysticism, Protection & Secrets. In ancient Egyptian, Celtic and Hindu cultures the symbolic meaning of the Owl revolved around guardianship of the underworlds and protection of the dead. In this light the owl was seen as ruler of the night and seer of souls. Often myth indicates the Owl accompanying a spirit to the underworld - winging it's newly freed soul from the physical world into the realm of spirit. Native Americans associate the meaning of Owl with wisdom, foresight, and keeper of sacred knowledge. I have drawn him encircled by sacred Oak leaves & acorns, symbol of Wisdom, Strength & Majesty. The crystal is Lapis Lazuli, revered by the ancients for its ability to awaken psychic vision, to rekindle inner wisdom & to remember to speak one's truth. Finally, in the evening sky you will see Venus shining above the trees, for Love & Wisdom are forever intertwined. The mystical Unicorn is mentioned throughout history & known for its untameable nature. Its horn was said to have the power to render poisoned water drinkable and to heal sickness. Thus the Unicorn represents Healing on all levels. It is associated with feminine energy. In one of his notebooks, Leonardo da Vinci wrote: ''The Unicorn, through its intemperance and not knowing how to control itself, for the love it bears to fair maidens forgets its ferocity and wildness; and laying aside all fear it will go up to a seated damsel and go to sleep in her lap, and thus the hunters take it." 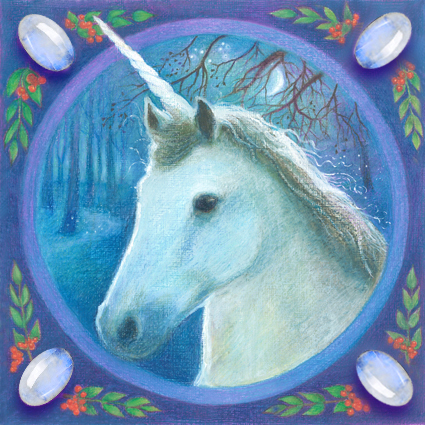 The Unicorn is shown in moonlight, with the Pleides visible through the tree and encircled by sacred Ash & its berries. The Ash is also known as the Unicorn Tree - to catch a glimpse of a Unicorn, carry Ash wood or leaves. Traditionally a tree that absorbed sickness, the spirally carved Druidic wand was made of Ash for this healing purpose. The crystal surrounding him is Moonstone, known to enhance one's connection with the cycles of the Moon, to deepen our relationship with Goddess energy & to enhance and open our intuitive powers.